Shinshinto: Ryo saku: Harima province. Blade length : 72.1cm or 28.3inches. 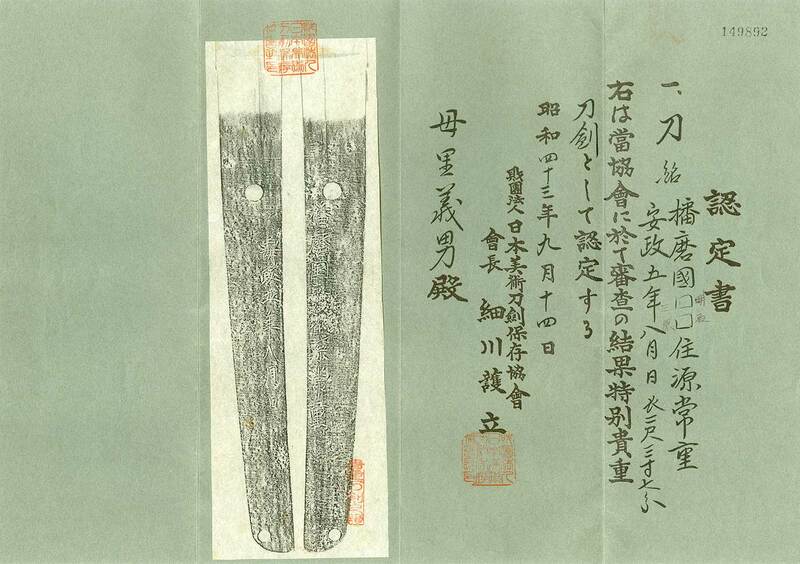 Width at the Kissaki : 2.13cm or 0.83 inches. Shape :The sword is wide and thick with deep sori. Chu-kissaki. Jigane :Koitame-hada quite well grained with jinie attach. beutiful Jiganae. Hamon : From Hamachi is Suguha and then Gunome Midare and Choji Midare. Boshi Notare and pointed shape. Special feature: Harima Kuni Mihara Ju Minamoto Tsuneshige is a sword smith of Harima province. He lived in Banshu Akashi. His real name is Sasao Taichiro. Tsuba : Round shape iron Tsuba, birds and plants are engraved with open work. Fuchi: Copper, flower is engraved with gold color. Menuki : Shakudo, Dokko sword is engraved. From Aoi Art: The shape and Jigana are nice. The Sori is elegant. At a glance, the blade looks like Genroku era’s Katana. The Hamon is also beautiful. The NBTHK paper and Torokusho says “Mihara” but there’s no area called Mihara but Miki instead. maybe NBTHK misread it.